You may want to buy a Wok for you to cook delicious dishes with. Wok deals from Groupon, Amazon, Debenhams, and other popular UK retailers would likely be on top of your options. Get big savings and you have the option to use the money that you have saved to buy more items. Our team of enthusiastic deal hunters has gathered and tested the latest Wok deals so you can be assured that any voucher code is up-to-date. With brilliant Wok selections from industry-trusted brands, we have hand-picked deals to help you stay on top of your savings. Oxo SoftWorks Wok 28cm save £25! Find amazing deals on top Wok brands in the Uk! A wok is a versatile round-bottomed cooking vessel. The cookware originated in China and is used in various parts of the world. They can be made from various kinds of material. 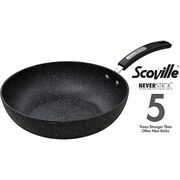 It can be used for different cooking techniques including searing, stewing, poaching, pan-frying, stir-frying, braising, boiling, and more. Cooking with a wok requires the use of long-handled utensils such as a ladle or spatula. This will prevent the cook from burning his hands. Its most distinguishing feature is its shape. Most woks have a rounded bottom. They also have a gentle flare to their edge to easily push food to the sides of the wok. Woks that are made in western countries often have flat bottoms which are similar to frying pans. Flat bottom ones can be used on electric stoves. On the other hand, round bottom woks are traditional and are mostly used on pit stoves and gas hobs. Most of these kitchen essential have a 300 to 360 mm size. These are the ones that are used in homes for cooking meals. Bigger woks that have a diameter of up to 910 mm are used for large quantities of cooking. These woks are commonly used in restaurant kitchens and other similar establishments. Cooking is definitely more fun when using a wok. It can make you feel like a professional chef at home. If you’re looking to purchase a wok pan or a non stick wok with lid, but afraid it will cost you a lot, then worry no more. Here at Latest Deals you’ll find bargain deals on quality best wok to buy online. We have all the latest offers around on all sizes of woks. 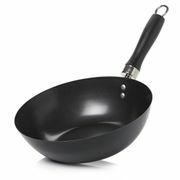 From small wok and large wok 50cm to Prestige Prism, Ken Hom, Tefal wok, and other popular brands. We have a massive community of bargain hunters who regularly share verified cheap wok deals, price drops, and discounts from across the country. On the other hand, our team of money saving experts will always provide you with essential tips and tricks that will be able to help you save on your instore and online shopping. Special offers are up for grabs so don't waste this opportunity to purchase a Tefal wok 28 cm or 40cm wok right now. You can all the mouth-watering and delicious dishes you have in mind without the need to compromise your budget with our help. You can get them from Amazon, Sainsbury’s, eBay, Groupon, Debenhams, and other UK retailers. Get as much as 50% discount on selected wok during their sale events, clearance, and flash sales . Watch out for their Black Friday and Boxing Day deals where their prices are reduced even further. If you want to maximise your savings, make sure to use the latest wok discount codes we have here. We also have voucher codes where you can get freebies or free shipping. Investing in a quality wok is a must most especially if you are fond of cooking various dishes. Take this opportunity to purchase a wok at a very low price. Get big savings and you have the option to use the money that you have saved to buy more items. We have listed the latest cheap wok deals and special offers available for you. You can easily purchase the wok that you want from ASDA, John Lewis, IKEA, Tesco, Argos, and other reputable UK sellers. Just be particular about the size of the wok that you are going to purchase so that can be sure to receive the right item. Also, you should also be particular about the material of the wok. Only purchase high-quality woks so that it can last for a long time. Quality woks are a great addition to your kitchen. Take this chance to purchase them at very reasonable costs. How to choose the best wok - With wok cooking it's important to start with the right equipment and you don't need to spend a lot of money to get a great wok that's perfect for your kitchen. John Lewis Carbon Steel Wok. This is a 24 cm wok that has a wooden handle. It is a traditional wok with a natural non-stick coating. It has a flat base so that you can use it for various cooking apparatus. This wok has gone through quality testing to make sure that there will be no sticking or burning when you use it to cook food. IKEA Tolerant. This 33 cm wok is ideal to be used by students. It is very lightweight and is large enough to cook meals for 2-3 people. It has a non-stick coating which makes cooking food easier and faster. It is also reasonably priced. Ken Hom Carbon Steel Performance Wok. This wok is best used by people who want to learn how to cook. It has a 31 cm diameter and has a flat base so that you can use it on electric stoves. The manufacturer also gives their customers a 10-year guarantee. Carbon Steel Wok. 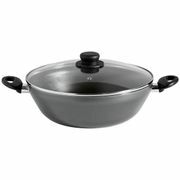 This 33 cm wok is best used for stir-frying food It is sturdy and robust. It is also perfect for cooks who are familiar with the seasoning process. Meals cooked with this wok receive minimal burning for novice cooks. Boiling. Used for boiling soups, dumplings, rice, or water. Braising. Used for braised dishes. Woks are very useful in reducing sauces. Deep frying. This is usually done with larger woks to avoid splashing of boiling oil. Pan frying. used to fry food by using small amounts of oil. Roasting. Food can be cooked in a wok with a lid. You can also cook food with dry heat. Searing. Food is cooked in high heat until the outer surface turns brown. Smoking. Food can be smoked by putting smoking material in the bottom of the wok. Steaming. You can use a wok together with steaming baskets to steam food.